Fabulous and Brunette: Toru: Wayfarer Returns by Stephanie R. Sorensen - Book Tour - Guest Post - Giveaway - Enter Daily! Toru: Wayfarer Returns by Stephanie R. Sorensen - Book Tour - Guest Post - Giveaway - Enter Daily! Hi lovelies! It gives me great pleasure today to host Stephanie R. Sorensen and her new book, “Toru: Wayfarer Returns”! For other stops on her Goddess Fish Promotions Book Tour, please click on the banner above or any of the images in this post. Be sure to make it to the end of this post to enter to win a $50 Amazon or Barnes and Noble Gift Card! Also, come back daily to interact with Stephanie and to increase your chances of winning! “Tōru: Wayfarer Returns” is, in theory anyway, a steampunk technofantasy, so I should be able to make it all up, right? Well, no. My story evolved from the fantasy adventure (“Samurai! With dirigibles!”) I had originally envisioned to something based in historical fact and cultural reality. The deeper I got into my story, the more I wanted it to be as authentic as possible in its portrayal of the times, the culture and the personalities of my Japanese characters. Though I was writing alternate history and fiction, I wanted my fiction as grounded in reality as possible, which means research. Within “research,” I include “other life experience” as well. I was drawn to write the story of Tōru and his battle to save Japan because I knew and loved Japan and its culture and history. I spent a year as an exchange student in Japan in high school and returned to Japan to work for several years after graduating with degrees in economics and Asian Studies. I studied Japanese history and language and culture both formally in academia and informally living and working there. Add to that a lifelong curiosity about Japan and enjoyment of Japanese culture in various forms, from manga and video games to the more traditional arts. Folks have been arguing a lot lately in the writing world about “cultural appropriation,” or the use of elements of one culture by a member of another culture. I’m a round-eyed woman of Viking-American descent, without a drop of Asian blood in me. Some folks insist I have no right to write about another culture not my own. Instead I believe it is the writer’s duty, gift, calling and right to delve as deeply as possible into every culture and character and flavor of humanity and convey those characters and cultures as authentically as skill allows. To write in clichés or stereotypes is to write badly, whether one is writing about one’s own culture or an alien culture, and is to be scorned. 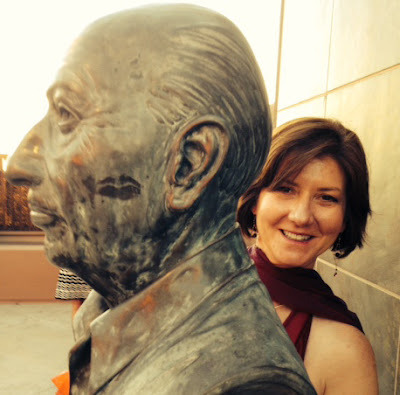 To share an experience of a different culture and character with readers is one of the great joys of writing. To write in a way that is respectful, authentic and real while avoiding clichés and stereotypes to the best of my ability means, for me, lots of research in addition to the life experiences and wonderful friendships I enjoyed in Japan. My superpower is that I can read a lot, fast, and remember most of it more or less coherently for short periods of time. Once I chose this period in Japanese history, I ordered every history book on Japan I could find on Amazon and plowed through them. Some were children’s picture books. Some were mighty tomes by academics on various theories of Japan’s transformation after opening to the West. I looked at drawings and photographs from the period by Japanese and Western observers. I was haphazard in my note-taking, not fastidious, but after a few months, I had picked up some fun details about historical characters and events to throw into the mix for atmosphere and had a pretty solid grasp of what was happening. So, thus fortified with double helpings of history and culture, I set out to write. That’s when I discovered a whole new layer of research I needed to do. First I made sure that every steam technology I used existed in the world in 1852. So sewing machines and dirigibles, yes; telephones, no. Then there is food. My characters needed to eat and drink while resting from their revolutionary labors. I know modern Japanese food, but what was available then, in 1852? I carefully included all my favorite Japanese foods in the first draft, when I was flying along trying to nail down the story and characters and not fussing about details. I had to throw out half those foods because they were foreign introductions from much later. So sad! Drawing on my experience in Japan, where my (male) Japanese colleagues spent much evening time after work enjoying excellent Japanese-made beer and sake in friendly camaraderie, I also wanted Tōru and Jiro and Takamori to relax in like manner. Alas, I discovered that beer was a later introduction and unavailable to my heroes in 1852, so they had to stick to sake. Jiro in particular was pretty outraged about this, as he had greatly enjoyed his many beers in the first draft. Then came language. I wanted to include key Japanese words in the English text, as I don’t think readers should escape a whole book about Japanese samurai without learning a few words, like “sword” and “lord.” I had carefully put those words in, using my very best knowledge from my time in Japan. I sent it off to Japanese beta readers, who basically howled with laughter. Apparently my high school slang was shining through. So they polished me up a bit with a few more upscale word choices. That battle raged on for a bit, though, because I did NOT want to sound like a Japanese samurai movie with lots of archaic phrases, as I dislike historical fiction where authors use excessive period-accurate but highly distracting archaic words. My handful of Japanese beta readers and I argued through the controversial words, eventually settling on mostly contemporary language with a few well-chosen period words. I’ve done my best to create a Japanese world, with truly Japanese characters, sailing around in flying dirigibles to save their nation from the evil foreigners while drinking authentic sake and local cuisine and achieving a thirty-year industrialization process in about eighteen months. It’s fiction, and wild adventurous fantasy, and absurd and real all at once, with a love story and a battle for the future of a nation. I hope you’ll try it and maybe learn a little about a real people I greatly admire through fictional characters I’ve grown to care about very much. Stephanie will be awarding a $50 Amazon or Barnes and Noble Gift Card to a randomly drawn winner via Rafflecopter during the tour. Thank you for hosting me today, and thank you especially for picking this post to share and highlighting the word "Phooey!" It made me smile. I want to live in a world where people are curious about other cultures and want to learn more about them, not a world where the only culture we can discuss is our own. I believe the first path builds bridges, and the second builds walls, and I love bridges. So I hope you'll check "Toru: Wayfarer Returns" out, and perhaps offer a beer up to fiction hero heaven in honor of poor Jiro as you read. This book sounds excellent! Thanks for hosting. 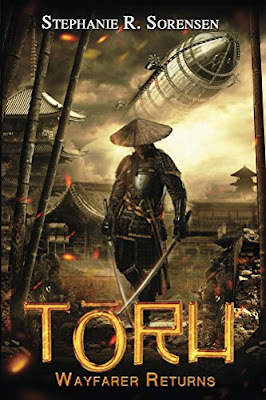 Just wanted to let you know I'm putting "Toru" on a $0.99 price promotion through the end of my book tour, so pop over to Amazon and snag your copy now. I am working on getting the price dropped on Nook, Kobo and iBooks as well. I hope you'll read it, and if you like it, post a review!